I would like to thank the director of the Wilmette Institute and the mentors who guided the participants through this course as well as the participants who enriched the discussions with their thoughtful reflections. Normally we excerpt comments from a student’s Learning Self-Assessment, but this time we are doing something different. In her Self-Assessment, Homa wrote about a number of things she had learned. 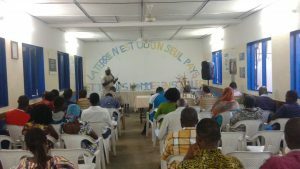 When she came to the question about summarizing ways in which she could apply or use what she had learned, she wrote, “I have volunteered to present the ethical and spiritual principles of climate change during the International Environment Day on June 5 in a panel discussion organized by the National Public Relations Committee of the Togolese Bahá’í community.” Invited guests included representatives from the Ministry of the Environment, the United Nations Development Program (UNDP), and Non-Governmental Organization representatives (NGOs). Here we present Homa’s report on the panel, together with a link to the PowerPoint (in French) that she used. Congratulations to Homa for jumping into public discourse on a topic that requires worldwide education and action. Mr. Lare from the Red Cross. Mr. Credo, who represented an NGO that works with women on improved stoves. An NGO who works with youth on the issue of the environment. Myself who represented the Bahá’í community. “My PowerPoint presentation summarized the Bahá’í International Community’s statement Shared Vision, Shared Volition: Choosing Our Global Future Together prepared for the twenty-first meeting of the Congress of Parties (COP21) in Paris in 2015. A major emphasis in my presentation was on the importance of unity of action and the role of individuals, communities, and institutions. The youth worked all morning before the panel to make a wall display proclaiming ‘The earth is but one country, and mankind its citizens.’ The NGOs present were very impressed with the display and took pictures. “As not all of the participants (including the Bahá’ís present) work in the field of environment and do not know much about climate change, we excerpted a fifteen-minute segment on deforestation from the video entitled ‘Home’ to show the cause of climate change in Togo (mostly through deforestation) and its consequences. We showed the video before the panel discussion. Then the representative of the United Nations Development Program read the message from Ban Ki-moon on the occasion of World Environment Day. He was followed by the other panelists. We had fifty-seven participants, including eighteen who were not Bahá’ís, mostly representing a number of NGOs. Each participant received a folder with copies of the statement of the Bahá’í International Community for COP 21; the message of the Secretary-General for World Environment Day; a summary of the agreement of 195 countries during the COP 21 in Paris; references in French on climate change that we found on Google; and a Bahá’í pamphlet. “During refreshments, we provided a book exposition so that participants could look at Bahá’í books and Ruhi materials. “The participants were very pleased with the panel and suggested that we continue our collaboration in the future. The Togolese Bahá’ís are preparing a letter to thank the participants and hope to have similar gathering again.